The upcoming re-release of Abe's Oddysee is getting more than a HD facelift. 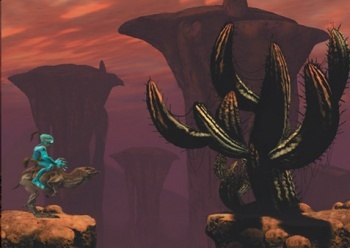 Developer, Just Add Water, has been working on an HD version of Abe's Oddysee since the release of Stranger's Wrath HD, last year. It was assumed the update would be a relatively straightforward affair - a simple switch to 3D in a similar manner to Grin's excellent Bionic Commando Rearmed . According to a Facebook update from Oddworld Inhabitants, the original developers of the game, there's more to it than that. The developers have decided to "reboot" the title. It won't just be an HD update of the original PS1 classic, but a new game built from scratch that uses the original title as a "blueprint." All the better, in my opinion. While Abe's Oddysee and its sequel, Abe's Exoddus, still hold up graphically, thanks to some excellent FMV and sprite work, the titles' twitchy controls occasionally pushed them from "punishing" to "infuriating." If you're a stickler for authenticity, however, the original versions of both games are available on PSN and PC. The game is due for release in the Summer of 2013. No news on a target platform.